Most of the Specks from the area around Phoenix are a pretty drab brown color (other than South Mountain, where they are a blue/white color). Not the prettiest speckled rattlesnake I’ve seen, but certainly more colorful than most I tend to see around my house. This entry was posted on Monday, February 6th, 2012 at 9:21 pm	and is filed under Photography, Relocation & Rescue, Snakes. You can follow any responses to this entry through the RSS 2.0 feed. You can leave a response, or trackback from your own site. Years ago, I had a sad experience with one of these in the Panamint Mountains, when I was in High School. (By this time, I already had a well-established appreciation of snakes.) A large group of us (My Dad, my Uncle, and a family friend, and attendant male offspring) were driving on a dirt road, when the friend in the lead suddenly stopped. By the time I realized a snake was involved, he was shooting at it. Everyone else was cheering him on, but I was thinking, “Why? We’re out in the middle of nowhere, so what’s the point?” At first, it rattled defensively, but then, it was reduced to covering its head, and that’s when the sorrow kicked in. I wish I had said something, but I felt I was too young. He finally put a round through its head and killed it. My cousins got the skin, and I got the meat. (No one else wanted that.) So, partly to justify the kill, and partly because I heard rattler was good, I ate my first rattlesnake. Yes, it was good, but a sad end to my first Panamint Rattlesnake. Wow, that is really a shame. I really don’t believe that most of the people who kill them in the wild truly feel as if they’re protecting anything, rather just have a shallow excuse to shoot something. I come across several snakes a year that have been just killed by the person ahead of me, usually still writhing, dead, miles from any building. Do you mean that they’ve been run over on the road, or are people on foot killing snakes when they see them, and then you come upon them after the fact? I can almost excuse roadkills, as the driver likely didn’t even know, but on foot, someone saw the snake and deliberately killed it. I’ve seen both instances. I’ve also seen people swerve to hit snakes in the road, and people slowing down first to make sure they can hit it. I was almost hit myself once, with a snake I was working with. You were nearly hit? That driver wanted that snake in a bad way! 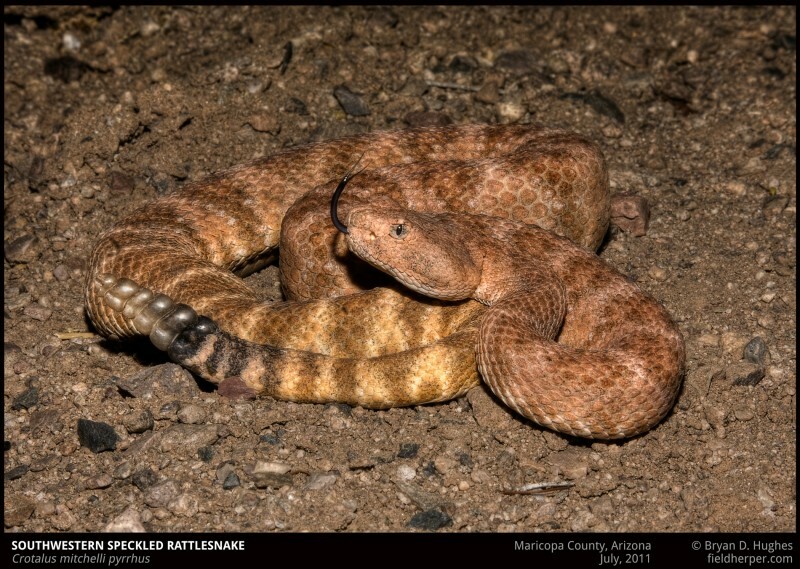 How common is it to find a rattlesnake on your property in the city of Maricopa? The fire dept. had to remove an adult rattlesnake from my garage last night. I’m freaked out and afraid I’ll see another one. I have children who play in my yard. Hi Jenny, I’ll email you.